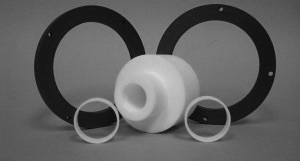 Are you an industry that uses PTFE filled or unfilled Bushings or Bearings in your operations? Do you need Bushings or Bearings machined to your direct specifications with no worries if it's going to fit when the product arrives at your facility? Looking to replace your worn out nozzle liner sleeves? Contact us today and let us know what you are looking for and our team of experts will get to work on your order. You will be very pleased with our turn around times and service experience. 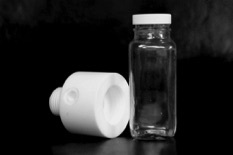 4B also carries a full line of polypropylene bottle adapters that allow you to save money on damaged dispensors by simply replacing the fixture versus the entire dispensor. We can custom fit the order to meet your needs. Our quality crafted PTFE Witch Hat Strainers will help you remove unwanted debris from your process streams. We can custom build to meet the specifications of your plant needs and will take into account the temperature and fluids being processed in the overall design. Have you considered utilizing UHMW Skimmer Guide Blocks for your operation? The engineering team at 4B can custom design these Ultra High Molecular Weight Skimmer Blocks to match the exact space and specifications of your plant needs. Contact us today to learn more.